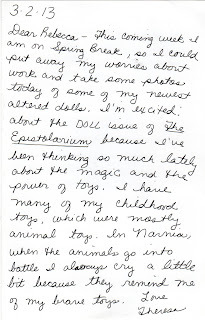 Thesesa is a poet-artist who teaches at Bowling Green State University and in her spare time publishes The Episotlarium online, with commentary. I have never met Theresa, so I'm just guessing that is the order she would put these things in, but she is a fabulous poet. I love her chapbook: The Galaxy to Ourselves (New Women's Voices Series, No. 93). 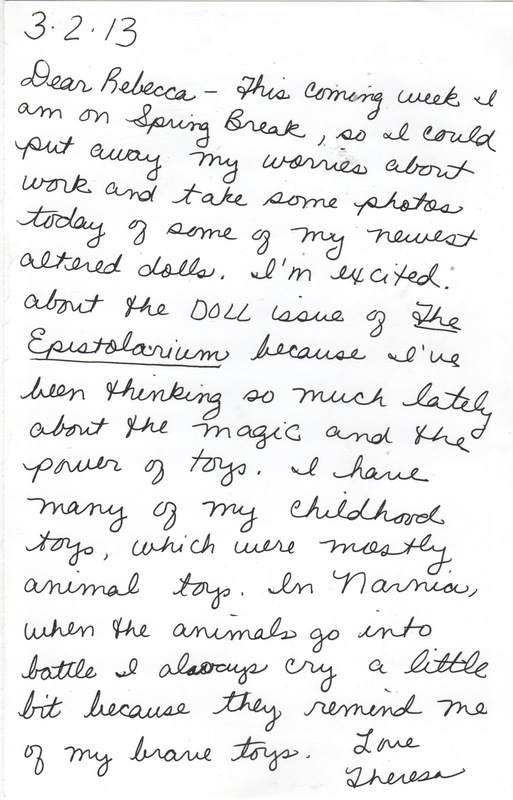 She wins accolades for her teaching and has published some of my stuff in the Episotarium.You can click on this link to download and read it: http://theletterproject.wordpress.com/2012/12/21/the-epistolarium-issue-one/ As an artist, a mail artist, she makes altered dolls, beautiful illustrations and I presume paintings and takes beautiful photos! Baby Dolly looks like she is deep in thought. I wonder what she's thinking. I also got a fabulous photo of one of Theresa's dolls - Baby Blue. Hope your having a great day. 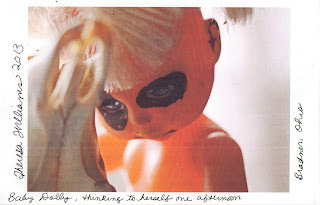 Just found a fascinating book in our library on dolls, CREATED IN OUR IMAGE, by Kitti Carriker. She discusses the psychological implications of dolls' creation. Can't wait to dig in! Do you know, you've just reminded me that i have a doll book in my library too. I will put it by my bedside and hope that it keeps me wide awake - usually I collapse immediately. I think I am ready to start thinking about dolls. Their influence is both personal and far reaching...I am really excited about learning more. Can't wait to see your art and thoughts!